While watching the slow act one in the film “Desert Dancer” my mind wandered and I wondered how much shown in a film ‘based on a true story’ are really events shown as they happened in real life or are they manufactured for the film? Also watching Freida Pinto I thought if this was the old days of the Hollywood movie studios one of them would grab her up, bring her to the States and build her up as the ‘next exotic’ beauty. 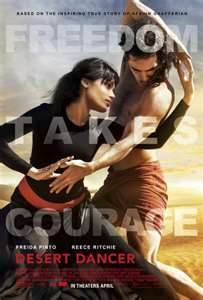 Back to the movie, which has three interesting dance sequences, the first showing how Afshin Ghaffarian, played by Reece Ritchie, became interested in dance and how he and Elaleh, Pinto’s character, devise dance by starting with the movements of hands. The second is the title dance that takes place in the desert where the dance troupe, hiding what is against the law in Iraq, feel they can dance free without repercussions. The third dance is a solo Ghaffarian does in a Paris Theatre explaining what has happened to him in Iraq and why he can’t/won’t go back. Did it really happen this way or has ‘Hollywood” infiltrated other film makers in other countries and this is ‘bending the truth’ a little or a lot? “Desert Dancer”, directed by Richard Ritchie, is the story of Afshin Ghaffarian, who wanted to become a dancer but knew it wasn’t allowed in his country and how he eventually left Tehran and found his dream in Paris. We follow his love story with Elaleh and the dance troupe of 4 consisting of gamin Marama Corlett, friend Tom Cullen and others. During the credits we see, and are told, what happened to Ghaffarian but nothing about the rest of the people we learn about in the film. Is Elaleh a real person or a reel one? If the former what has happened to her? What happened to the others who were involved in his life in Iran and helped him become a dancer? Here I come Bing! “Desert Dancer”, at 104 minutes, has a slow set up but a very effective, moving climax.